Who are your Walt and Ruby and what do they mean to you? What emotions were most powerful as you got into the middle of this book? Our teleconference call is at 7AM CDT Tuesday, July 13, 2010. The Austin number is (512) 501-4531 and dial the code: 121014#. Remember that your comments and questions are welcome here! There are certain requirements for vitality recharge. Here is the list of requirements and why our selection for this month is Ruby And the Stargazers: A Fireside, Texas Novel , by Marci Henna. Take yourself away from a few minutes to entire months. Fiction reading is a great way to get away fast. We picked Marci Henna’s book for our selection because it captures the flavor of the freedom of youth. Texas is known for independent thinking and this book gets you right in the heart of it. Marci lives here in Austin, not far from Laura’s Library. We are working on a date to get Marci to chat about her book to our book club members. 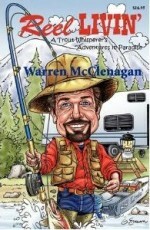 Lest any reader is having difficulty embracing a fling with fiction, another choice and a great gift for Father’s Day is Reel Livin’ by Warren McClenagan. Warren lives up around Amarillo and is a hoot of a story teller. His recounting of summers spent camping and fishing with his family will take you away nearly as quickly as Marci’s fiction. 2. Treat Your Body Like it is Summertime. This is not a time to overindulge. Summer lives on the hoof. Enjoy the feel and taste of fresh peach juice or watermelon dripping down your chin. Get sticky with a snowball and wear your flip flops. 3. Give Some of Your Time to a Cause Larger Than Yourself. Help your community in some small way. Play a game of hop scotch with the neighborhood children. Take a group hiking in the greenbelt that normally is more comfortable behind desks. 4. Have Fun and Make Sure You Notice It Happening. The worst thing about work or school year round is that one sometimes forgets to notice when relaxation and fun are happening. Make it memorable and record it in some way. My favorite toy for recording it right now is the Flip UltraHD Camcorder . Remember, June is a month with a Fifth Tuesday. That is the day we all have agreed to have fun at 7 am and 7 pm, to record it and report it! Make sure you leave a comment on the June 27, 2010 post with what mischief you got into! Marci Henna’s Ruby and the Stargazers is just what this doctor orders for summertime relaxation. Marci has agreed to meet us by phone to discuss her book on Tuesday, July 6, 2010 at 7 PM CDT. The teleconference number is (512) 501-4531 and enter the code 121014#. Marci is a thoughtful writer and a very busy mother, wife, grandmother and community supporter. Learn her secrets for creativity, productivity and differentiation on this call. 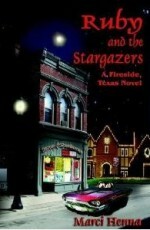 Now let’s get down to the first discussion questions about Ruby and the Stargazers. Remember, we have weekly discussion on Tuesday evenings (7PM CDT) by phone the first and third Tuesdays of the month and on Tuesday mornings on the second and fourth Tuesdays of the month (7AM CDT). We will have four discussion calls July 6 and 20 at 7 PM CDT and July 13 and 27 at 7 AM CDT on this book and no live meeting this month. Do you have your own Fireside, Texas to return to? What is similar between Marci’s Fireside and yours? 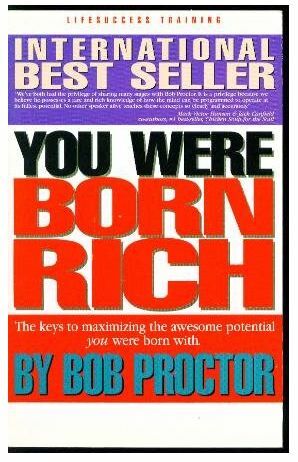 With whom do you identify most closely in this book and why? How has the Douglas Jerrold quote proven to be true or false in your life? Remember, if you cannot make the call, you can always discuss the questions in the comments below. Also, if you have specific questions for Marci, she will be joining our calls on July 6 and July 20, 2010 at 7 PM CDT. Don’t forget August’s book is Parent Effectiveness Training. We will be practicing Dr. Gordon’s suggestions on all of the calls and at the live meeting in Austin on August 17, 2010. These communication skills can transform any relationship and are not just for parents. Do not miss this opportunity to develop a new communication habit. If you can’t join us live, call in to (512) 716-6511 code 973640# at 7:00pm CDT for a teleconference discussion on Tuesday, June 1, 2010 instead. Remember, your questions and comments below help all of us to become better at book application, the next stop after reading. 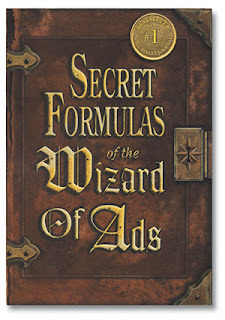 Dial in on Tuesday, May 25, 2010 at 7 AM (CDT) to (512) 716-6511 973640# for a hour long discussion of Part Five: Doing the Hard Thing and Part Six: How Then Should We Live of Secret Formulas of the Wizard of Ads by Roy H. Williams. An adventure in precise communication, this collection of essays sprinkles practical application amidst vivid mental images and concept theory. How will you measure your success in the three worlds of business? Do you have the two characteristics of the “amazingly successful? How does it show in your life? Which face on Mount Rushmore is closest to your own? Recordings from prior calls, and other book club resources are found under the resources tab. Let me know how it is going and what your questions are in the comments below. Roy Williams is right. Words are electric. 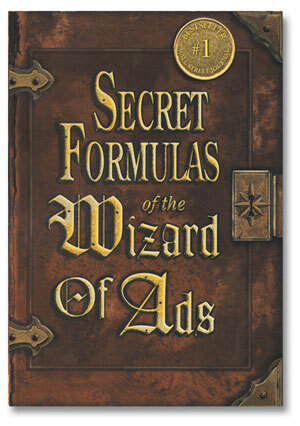 The chapters in Secret Formulas of the Wizard of Ads brim with color and vibrancy. Discussing it with intelligent eager readers was a great way to energize for the whole day. Next Tuesday at 7:00 PM CDT dial in to (512) 716-6511 then enter the code 973640# for an hour long teleconference discussion of Part Three: Side Door into the Mind and Part Four: Turning Lead into Gold . Much more than a book about ad writing, it is a primer in persuasive communication. Why dont’ you plan to meet us at Laura’s Library at 6:30 PM on June 1, 2010 for the First Tuesday Book Club live discussion. Not in Austin? Plan you own meeting for that evening. I look forward to your comments and questions on this book. You can post them here! What’s the buzz? There is no buzz if there is no one to hear and help move the message. So how do you become a master message crafter? Become a great story teller. You can improve your story-telling skills with three easy steps. Build a portfolio of your own stories. Actually write them down. Edit your writing so your messages zings into the listener’s ear. Read about 80 pages per week. Don’t worry, there are lots of pictures. Meet with other folks doing the same thing once a week. Call in to (512) 716-6511 and use the conference code 973640# at 7 am CDT on Tuesday, May 11, 2010 if you want to join other like-minded folks reading this book this month. Give an example of how the “most powerful force ever” makes a difference in your life. How are you using the “bridge of magical fire” in your life today? 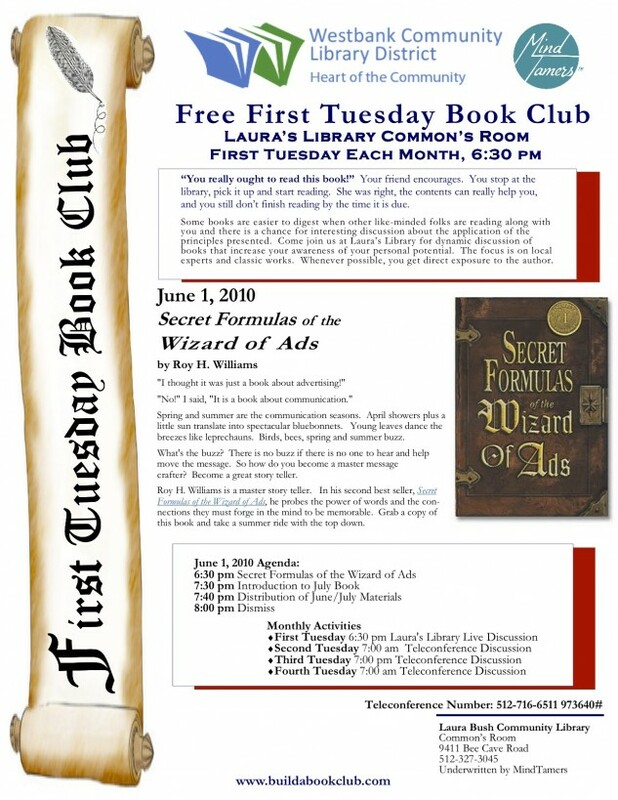 June 1, 2010 at 6:30 pm at Laura’s Library in Austin for the First Tuesday Book Club. If you would like to meet the Wizard of Ads himself for free, go to the free public seminar on May 21, 2010. Don’t delay, this event sells out every time it is offered. Here’s to more successful connections in every aspect of your life. If you like this idea of a master mind book club, you can learn how to build your own successful book club or join ours as an insider. Buzz buzz! Post your questions or comments here. Let me know if you want to hear the recording of this week’s teleconference. Bob Proctor is a professional at the application of mind discipline. 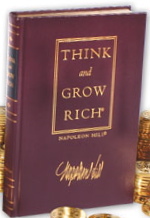 This book is his distillation of the ideas taught in Think and Grow Rich by Napoleon Hill. Here are five thought questions to get you started with your book group if you want to cover You Were Born Rich. Which poem is your favorite in the book and why? Do you agree with Bob’s discussion of Source energy and God? In what ways are you preventing yourself from being like Paul Hutsey? Do you have any examples of how you acted like Bob’s Aunt and it worked? Do you believe the idea behind the title applies to you? 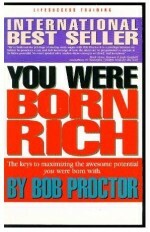 List your comments and questions here about You Were Born Rich. If you are ready to get started studying with us or want to get your own group started, register for the tips of building a successful book club. Download free reader’s guide and book pdf from the resources page.